Through Keep Your Fork Ltd, I’ve been supporting Research Retold, a business which turns complicated research documents into easily-digestible summaries – helping researchers to more effectively communicate their findings. 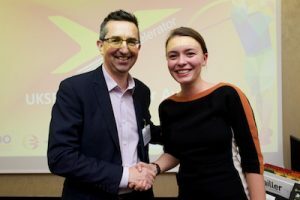 So I’m delighted that Mihaela Gruia, Research Retold’s founder, was the winner in a competition to receive a £25k equity investment from UK Steel Enterprise through the Y-Accelerator startup programme. It’s also great to learn that the team at UK Steel Enterprise was so impressed with the quality of the Y Accelerator participants that are planning to offer investment to three other businesses which participated in the programme, namely Reach Homes, Brailler and BearHugs Gifts. Keep Your Fork have also supported BearHugs; and I’ve previously interviewed Jon from Reach Homes, here. Keith Williams, Regional Manager of UK Steel Enterprise, said: “The eight businesses who made it to the final pitch event have been through a challenging programme forcing them to demonstrate the viability of their products time and time again. If you’re looking for support with investment readiness or marketing strategy, then please get in touch through the contact page. Or take a look at the range of services that the Keep Your Fork team (I’m a senior associate there) can offer you.